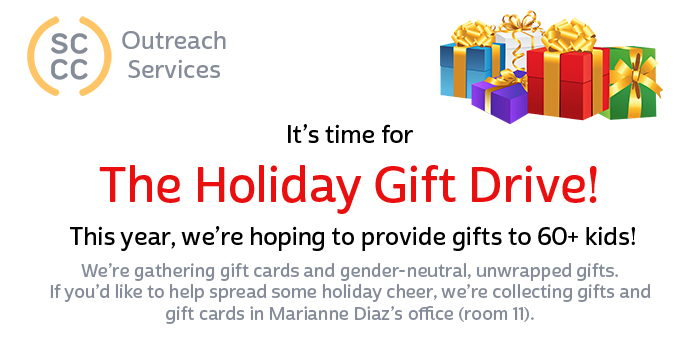 Southern California Counseling Center | It’s time for the Holiday Gift Drive! We are now in phase (2) of our effort for the families we gave thanks to with the Holiday Feast Drive. This is THE HOLIDAY GIFT DRIVE and is focused on the children in the family. I have always felt, and I could be wrong, that The Feast supported the heads of household while the GIFT provides excitement directly to the youths. I hope we get a huge response because the youths in the communities we target are surviving against tremendous social injustice and systemic oppression. The parents are afraid often and find it difficult to make due let alone purchase gifts. Last year we provided gifts for 60+ Children. I am sure hope the number will be comparable this year. As “individuals” or as “supervision groups” or “friends who hang out groups” pick a family. If you have access to cool stuff that is new bring it! Maybe you even have cool stuff you take for granted like access to tickets for sports or events. The easiest things are of course gift cards and believe me they matter. Here are the most popular cards, TARGET! Food Cards like Burger King or Popeye’s. Please note that transportation is often a consideration and for Watts TARGET is the closest and Food 4 Less Supermarkets. You can get support if you need from those of us who have done this many, many times before. If you decide to purchase a gift please remember to wrap it, label it clearly and you can also write on a tag what it is. We won’t tell. If you have access to toys or other cool events let us know. Some of these kids have not experienced very much and this act of support tells them people other than their family care about their life. Please know that the things we might often think of as typical outings are huge events for youth and some kids I have encountered have never been to a theater to see a movie or a sporting event. Marianne Diaz, Tamara Satterwhite, Robbyn Coffey and Emily Beach. No Replies to "It's time for the Holiday Gift Drive!"